Subject: it's a heart attack! Subject: Re: it's a heart attack! I grew up in a Russian/Australian family and this is how we make strogonough. Please never use Kefir or plain yogurt as a substitute of the sour cream. It is very hard to find a good sour cream in USA (by the way I am Russian) and Kefir or yogurt will ruin everything. That is not about fat, cholesterol or calories, the food that we eat should taste good and in order to enjoy it never try to calculate calories or think about fat. I made this tonight and my wife and I loved it. In the flow chart you have "deglazing" after cooking the onions. This usually requires adding a liquid. The text above does not mention this, but does talk about scraping the fond. Are these equivalent terms/processes? Yes, deglazing requires liquid. In the case of this recipe, the onions provide the liquid as they cook down. 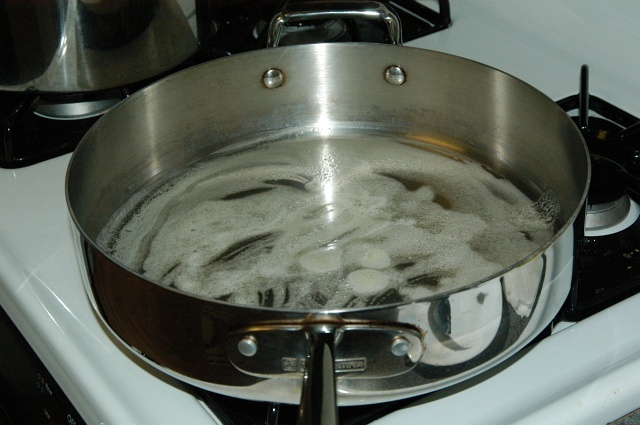 The water they release is more than enough to loosen up the fond on the pan. Is there something that can be used to substitute sour cream? I live in Brazil now and have never seen any. if you add a little lime (no lemons here that I've found) to a canned cream would that work? I'm not sure what canned cream is, but using a one to one substitution with plain yogurt should yield good results. My husband tells me that he likes Beef Stroganoff. I went looking for recipes and found several. I read them to him and he told me that the Beef Stroganoff he remembers had some type of cheese (perhaps swiss). I am open for suggestions. Thanks! Weightwatchers has variations on this recipe (which I can't post here without infringing their copyright). Essentially, the main variation is to stir in creme fraiche once the rest of the ingredients are cooked and removed from the heat. If you want to keep the points down (or cholesterol), you can also do a chicken stroganoff - not as good, but not bad, either. I always add garlic to this dish when I make it. 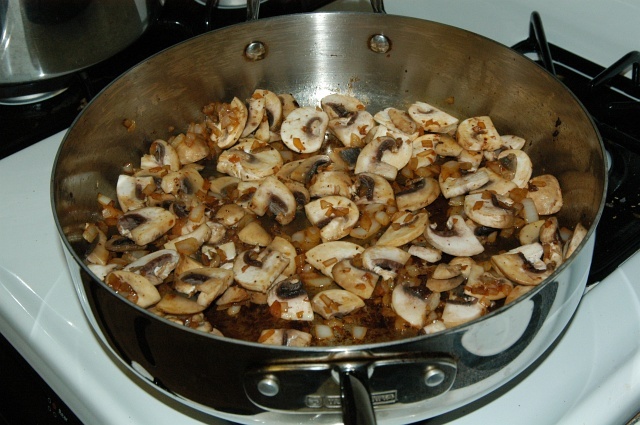 It especially tastes good if you roast the garlic first, crush it up and add to the onions and mushrooms when you are sauteeing. As far as having a coronary goes, the way I see it, I'm going to die anyway and I'm not going without tasting beef stroganoff, Turtle cheesecake or Chunky Monkey ice cream. Robin- I live in Brazil too. You're right- creme de leite with some lim�o makes a pretty decent substitute for sour cream. Not quite as thick, but it's pretty good . It's what's used in the Brazilian version of stroganoff (which is completely different than anything posted so far). Anyway, FYI, if you want a sour cream substitute for making dips or putting on Mexican food, try creme de leite, cream cheese and lim�o. It takes a little work to get the balance right, but it's pretty acceptable. Mmm. I made this tonight. Excellent dish. I thought the dill was a bit too strong, but it turned out I just needed a bit more salt. The salt really brought out the rest of the flavors and balanced things nicely. I disagree that the sauce is so powerful that there's no need to drench the noodles in it. I think it's less visually appealing to toss the noodles with the sauce, but I think it'll taste better. Some of the noodles just seemed too dry, and honestly, the sauce isn't that strong. It's fairly rich, but it's not at all overpowering. Oh, and I used chuck tender roast for the beef. I sliced it crossways against the grain pretty thin (thickest was probably a quarter of an inch or a little more, thinnest was nearly transparent, average was somewhere toward the thinner side, but opaque) and beat it with the textured side of the mallet. Turned out tasty and tender. Stroganoff is not stroganoff without pickled cucumber. Similar stews have been cooked for centuries in russia (and finland) and the pickled cucumber is what makes it stroganoff. 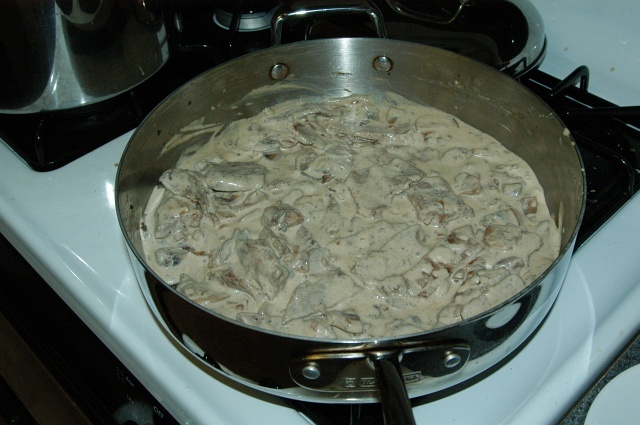 The recepie you wrote is called dillmeat in finland and quite common but has nothing to do with stroganoff. It should also stew a lot longer. 1 hour minimum. Cut meat as suggested in the recipe. Take a skillet, melt butter and add oil (1:1). You need quite a lot, because it should cover the onions. Put onions to cover the bottom of the skillet (that's why we needed rings). 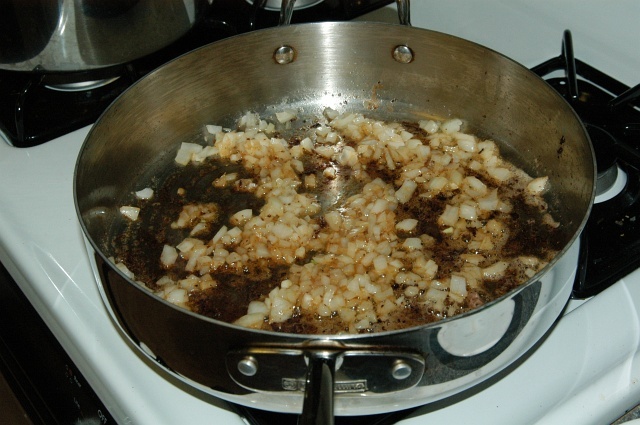 Put meat onto the onions, so that it doesn't touch the skillet! Do not mix! Add salt, pepper, spices, close the skillet. Allow it to stew on the high flame for 5-7 minutes until the meat is brown and (it will not burn don't worry). Now you can stir it, add sour creme (1 cup), tomato sauce (1 tablespoon) or ketchup, garlick, mustard (2-3 teespoons) and mushrooms (if you prepared them). Stir well and close again. It should simmer for 15-30 minutes depending on the meat. It is ready when the meat is soft and you almost cannot see the onions. Before serving add some lemon juice. I find all these variations on Beef Stroganof facinating. The version I grew up with has no dill or mustard, but Worcestershire sauce for seasoning. I know stroganof is usually served over noodles, but I 've also served it over rice or couscous, with couscous being my prefered method. For those who wanted to replace the beef, you can make an excellent mushroom stroganof if you use a nice variety of mushrooms instead. 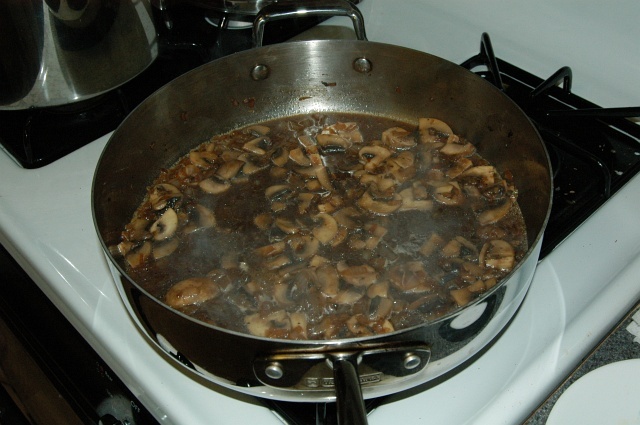 Experienced a brainfart -- okay, maybe it was due to a few beers and six dogs snaking around me while cooking -- but I forgot the beef broth step. 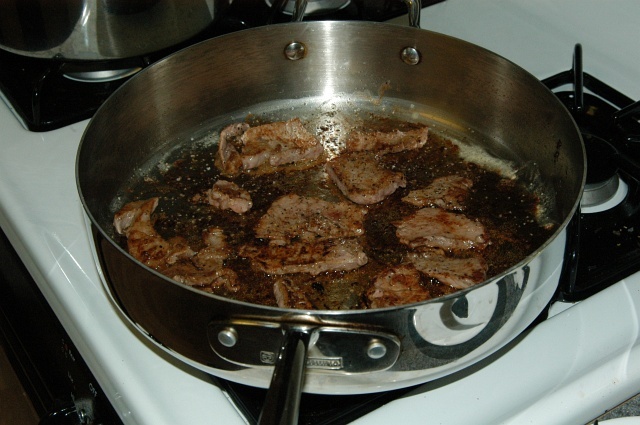 However, when I sauteed the beef, I left two or three small oddly shaped pieces in the pan so that I might get a bit more beef flavor while cooking the onions and mushrooms. These were "throwaway" bits of beef for the sake of the sauce. I hope their flavor helped compensate for my lack of broth. (Sure wondered why that can of broth was just sitting there on my counter -- a smug grin on it's tin face). I tend to favor more spices in recipes than are usually called for -- I think we Americans like our foods too bland -- so I actually bumped up the bit of dill. (Dill + beef = exquisite taste sensation... I'm sure there's a mathematical/scientific formula for that somewhere). Didn't have cognac (cheap date that I am) so I used a bit of cooking sherry. Very nice version of stroganoff that's easy to prepare and is a wonderful comfort food. I will make it properly next time (out of curiousity more than anything now), but I was very pleased with what I had created sans-broth anyway. Bon appetite friends! And for those that misguidedly fixate on cholesteral/sat fats... just remember all the women that skipped dessert after dinner on the Titanic... you only live once, so enjoy life's pleasures. I made this dish last night and I have to say it wan't the best - a bit dry and the flavour was their and it was passable, but a bit of a disappointment. Leftovers in the fridge overnight, back in the pan - stroganoff and pasta together - added a little more sour cream and a little more dill (I used the real thing) heated for three minutes, and wow! One of the best dishes I have had. The overnight stay in the fridge made a ton of difference. First off, I would like to tell you what a wonderfull forum you are maintaining. However, I have some comments on this reciepe. I would like to second the gherkins. Mushrooms are a nice additon, but it is not a Stroganoff if it does not contain gherkins. Another point is the stew time. It should simmer a good while longer, which, as a bonus, makes the cheaper beef cuts a better choice. I usually serve Stroganoff over fresh, homemade Sp�tzle. I used this as a starting point for some Beef Stroganoff this weekend. I didn't remember the mustard, and I used Leeks instead of Onion, but it turned out great. I've been reading your site for about a year, thanks for all the work you put into it. Subject: Real stroganof does not need to cook for a long time ! I know several have mention that it should cook for several hours... but that is a modern way =by using cheaper meat = not so tender meat = long cooking ! Use tenderloin or filet and only cook very briefly- meat should be pink in the midle when dish is done ! how interesting that there would be so many comments about authentic foods. I try to be authentic. However, what is an authentic American hamburger? Does it have cheese or no? sesame seed bun or no? Thousand island dressing or no? There is no acceptable way other than a bun, ketchup/mustard, and a pattie...that is a very boring american hamburger, but would be 'authentic'. 3rdly ... a student budget doesnt allow cognac .. dang .. so cud i do without it or wat wud be a budget friendly substitute? 4thly ... im studying in russia .. im not so sure if i can find beefstock at the supermarkets .. or maybe im mistaken .. or does anyone have an idea how i cud go about it ? well .. looking forward to hearing from anyone .. Cool that your expierimenting with dishes even if forcefully so. lets start with the bottem point. 3)Cognac is just brandy(distilled wine) from a specific region of france. you could substitute a nice quality red wine instead or any brandy. omitiong this ingrediant wont change the dish but may detract from the complexity of the flavors. on a students budget go without it. 2) Pork would work ( whats in a name anyhow) but would change the flavor of the dish some. cooking isn't like baking, ingrediants can be changed and the dish (for the most part) will stay the same(for example rillets or consume'). if it taists good to you then do it! be that as maybe, this is quite a versatile recipe, and if you just cook it a little slower you can get away with cheaper ingredients (maybe not the $1.88/lb rump as mentioned above, but certainly not the $13/lb sirloin...), as my mother has done since time immemorial (to myself), always coming out with something delicious and not too difficult to chew. also, whoever complained about this being full of cholesterol....... get a life! you may extend your lifespan another few minutes by skipping the odd delightful stroganoff.... to what end if it's just another flat salad you're waiting for? I eat healthily most of the time, I recognise the value of it even on a day to day basis (energy levels, future health, and what you might call ease of digestion) but don't deny the sensory pleasure of the occasional full english breakfast or cream-laden delicacy when the (sadly rare) opportunity comes around. It's not something that will cause a terrible impact on your health so long as you don't have it for every meal and stay nominally active. I'm feeling fairly confident that my overall health at age 50 will be likely better than that of either of my grandfathers, and probably my father for that matter. the tomato paste added flavor, and the lemon made the creamy sauce not so heavy. I will definitely make this again. My husband is allergic to onions. Is it possible to make this dish without it? Thanks. I love beef stroganoff. I have always seen it as the white and the red version which my mother introduced me to. The white version, to me, is the mustard, onion and sour cream version. The red is the tomato version and it takes so much butter I am ashamed. I always like to mix it up and try something a little different. I guess I need to try some pickles. I agree the cheaper meat and the longer cook time is better to me as the meat is my favorite. I like it over noodles or rice with the red. PS - Stroganoff wasn't in my spell checker! How ludicrous. I have made the dish two times and it is a very good recipe. 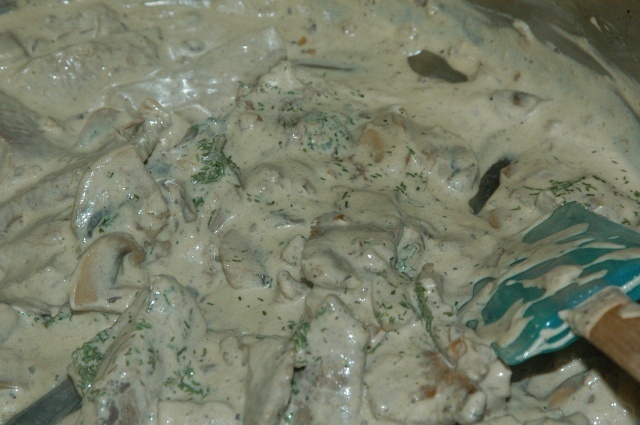 It is now my favorite stroganoff because it is simple and has a unique flavor. The dill is a brilliant idea. As for the Aussie's comment that the his version might be too rich for the American palette, add a little Vegemite and maybe that would tone it down a bit so that we yanks could stomach it. I just checked it in Firefox and Internet Explorer. Looks like there's a weird problem with how Internet Explorer wants to print the page (it refuses to shrink the table down to fit!). On this particular article - you can get it to print on one page by changing the layout to Landscape. Sorry for the trouble (and the much too large table once it prints). i made this for my daughter's school project last year and everyone enjoyed it. her teacher invited a bunch of other teachers to try some too and many of then asked for the recipe. when i made it at home, even my husband who hates sour cream and onions had more than anyone. i found that if you refridgerate it over night and then reheat it the next day it tastes better though. it sharpens the flavor. Interesting discussion in the comments here. Googling around for a stroganoff recipe for tonight - has to be non-dairy though. I'm going to try goat yogurt instead of sour cream and cross my fingers. Thanks, too, for the recommendations of pickled cucumber by various commentors - I believe that will add some nice zip!. I am from Slovakia, with Slovak and Austrian background. We NEVER use garlic in cooking stroganaff, nor tomato paste, or other odd items. 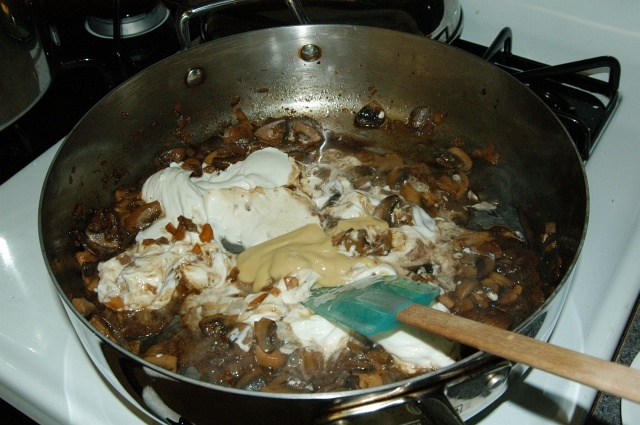 It is beef, mushrooms, onions, and sour cream. Salt and pepper, is all right. 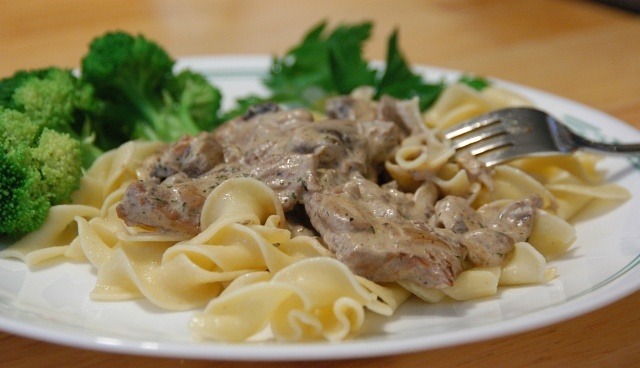 There are so many Beef Stroganoff recipes on the Internet, it must be a favorite dish with a lot of people. I don't think that it's a sacrilege that people modify a recipe to their own taste. I think a recipe is more of a guide, a rule of thumb, rather than some chemical mixture which must be followed to the letter for the desired effect. I liked Michael's addition of Dijon mustard and the cognac. 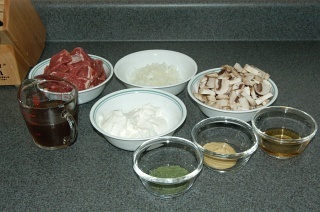 I also liked some of the ingredients I found in a Stroganoff recipe on the Simply Recipes web site (ex. nutmeg and tarragon). I was hesitant about the dill. Perhaps I'll use it in the future. I decided to use sirloin instead of tenderloin, as suggested by Simply Recipes. The former being much less expensive. So I basically combined the two recipes. The result was very good. Perhaps it wouldn't live up to Count Stroganov's expectations, but then again I was making a dinner for me and my wife and not the Count. I'm no engineer, but I am so grateful to have stumbled on the site's Beef Stroganoff recipe! I followed the directions exactly (well, almost: I used beef bouillon instead of broth), and came up with the BEST Stroganoff I've ever made... or eaten! My partner and I are both good in the kitchen, yet we couldn't have improved on this recipe. Thank you so much!!! I forgot to say I also used sirloin instead of tenderloin (which was $20/lb. at the market yesterday). I cut out every scrap of fat or gristle, and browned it as briefly as I could, and it was perfectly tender and delicious. If you heat the pan, melt the butter, lay the pieces down, and as soon as they're all down start turning them, and as soon as they're all turned start removing them --- you won't toughen the meat. My whole family loves this recipe. We have made it several times. The only thing I change is we use fresh dill instead of dried dill. I grew up with the tomato sauce/paste version, but I really prefer this one. Subject: What a neat site! This is a very nice recipe with great pictures and wonderful directions. I will be trying this recipe with the substitution of goose breast (marinated in salt water, then in milk, now drained and frozen) this weekend. I am debating if I should use chicken stock/broth instead. Do you have any ideas or recommendations? when dealing with 'poultry' I often sub chicken / turkey stock - using turkey stock/broth in chicken, for example, adds a layer of flavor - it's like - okay it's chicken but there's something else tasty . . . .
in this particular instance I'd say a poultry stock is a better choice with goose vs. a beef stock. Oh, Thank you. I can understand this. You are my Christmas dinner hero. OMG - this ROCKS. I did however, add 1 T FRESH rosemary and it was an utter MO (mouth orgas....) wow. Thank you. I used red wine in place of cognac and used about a 1/2 cup with the stock. Served it over 1/2 whit and 1/2 brown rice. utterly amazing. I've a question, the "meat broth", is this thing, kind of tablet/capsule of "meat" flavor http://www.telecompra.cl/components/com_virtuemart/shop_image/product/490b816...jpg, is it raw meat blood, the juices that the meat itself leaves when cooked or what? thanks and I know it kinda dumb but I'm from a spanish speaking country and it's not clear for me. Subject: Beef Stroganoff . Comments over the past 5 years. I've enjoyed reading all this stuff and the many variations on...er...beef Stroganoff. I'm having friends for dinner tomorrow night and will cook my classic Strog with finely crossgrain-cut fillet steak, onion, thick sliced mushys, nutmeg, and creme fraiche. I might throw in a couple of shots of brandy but there the quirks end. Serve wqith Tilda basmati, which I reckon to be the best. It takes 10 minutes while we all slurp wine and moan about footy in my kitchen. Boringly basic but wonderful. Gets better as the wine flows. I like Michael Chu's recipe, but I'd get rid of the Dijon. Cheers! your ingredient list does not include noodles (or rice) (which are referenced later in the instructions). this poses a major problem as one would go to the store and not have a major component on their shopping list. i understand you reference it in the overall content but it must be indicated in the actual list... its common sense. and for that reason, i hope you have errors and omissions insurance as an engineer. this kind of thing would get you sued or even worse someone could get hurt in the world on engineering. if you were put before my quality assurance program, this project would be a disapproved -revise and resubmit. also your confirmation code protocol is very weak. go back to the original pleae.. Mastermind of the Astoreiel Structural Benefactor Program. 25 Patents in 15 Countries and Inventor of the world famous SkyHook (tm). Beef Stroganoff, in its simplest form, is simply tender beef with a mushroom and sour cream sauce served over rice or noodles. >>(which are referenced later in the instructions). later is worse than the first sentence? btw, real engineers read through all the specs before bidding. "Begin by assembling the ingredients: 1-1/2 lb. beef tenderloin (if using another cut, select a lean cut and remove any excess fat, gristle, or membranes), 1/2 medium onion, 1/2 lb. button mushrooms, 3/4 cup to 1 cup beef broth (preferably low sodium - salt can always be added but is difficult to take out), 2 tablespoons of cognac, 1 cup sour cream, 1 tablespoon of Dijon mustard, and 1 teaspoon of dried dill weed. " also, your graph does not indicate egg noodles..
as we are both engineers we can dispute the nuances till we are blue in the face.. i was just trying to poke a little fun at a comrade... take it lightly..
all said and done the recipe was AWESOME.. totally delicious.. would make again, with egg noodles of course..
keep up the great work fellow engineer. as you intended no serious barb - I would add.... over rice or noodles means the chart must incorporate either / or / both - the plot thickens. ps: it's Michael that does the charts, not me - but I think they're pretty neat. the instructions also do not include "turn the knob to the right" to make heat on the cooktop. bottom line: at some point one must assume the cook has a passing knowledge of what the heck is going on. the recipe does not also explicity state "use a spoon to stir...."
where does it end? how big a pot to put how much water in to cook how many noodles? is this the most appropriate set of directions for someone who has zip comma zero idea of how to cook or what "Beef Strongoff" is but thinks it sounds neat for dinner? perhaps not - they may not know how to cook rice or noodles. is that the point? no, methinks. noodles, or rice, taste pretty much like noodles or rice for any other dish. the point is how to "make the beef" - as Clara might have said. btw, I went to www.uspto.gov - was unable to come up with any reference to any part of AE129030992; nor does Google; might want to check into that. Sorry, for not chiming in earlier. I obviously agreed with Dilbert when I wrote this recipe over five years ago, but I also understand Marty's point about not showing the carb component in the final summary can lead to trouble. In light of the discussion, I was thinking about adding something, but beef stroganoff can be served over so many different "bases" like rice, noodles, dumplings, spaetzle (as Dilbert pointed out) that it seems like it would be difficult to add to the summary without seemingly limiting this recipe. Perhaps, I'll simply add to the serving size area - something like "(over rice or noodles, serves 4)". As for the skyhook patent, I was also curious to read it and unable to find it. The number portion is too long for a US Patent, isn't it? My last patent, from 2005, was just shy of #7,000,000, and more recent patents are around 11-12,000,000. Anyway, I'm guessing the skyhook part of Marty's sig is a joke. Skyhook references used to be popular with some older engineers I worked with (as a way to send the younger engineers on a wild goose chase after something that doesn't exist), but these days there are a couple dozen different companies out there that make a product with the registered trademark Skyhook... I feel silly falling for that (again). Unless, there is a specific Skyhook that Marty invented, then I'd be more interested in hearing about it! 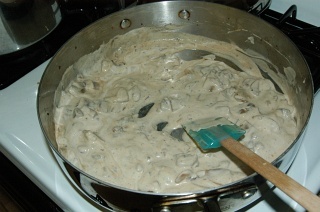 Just made this stroganoff recipe and served for dinner. It is absolutely the best I have ever tasted and my guests are asking for the recipe. I used Flat Iron Steak and it was tender and delicious. I love your website - I am a newcomer but will be back. My family has a completely different recipe for the "classic" beef stroganoff. My family's recipe comes from a Russian restaurant, in Hong Kong, circa 1954. So I'll admit it probably isn't the most "authentic." It is a tasty variation. Instead of dijon, we used dried mustard. No booze, either. Extra secret ingredient instead of dill is marjoram. Yes on browning meat, onions, & mushrooms. We add water (or I guess stock would be easy), and cook until reduced and meat is tender. Also the spices/herbs are added after browning. Just before serving, add in sour cream. When I make it, I do noodles. When my grandmother makes it, it is always short grain white rice. I don't know why, but this is the tastiest version that I know of. It is probably a little milder than Chu's recipe, relying more on the natural sweetness of the onions, earthy mushrooms, browned meat, etc., and only rounded out with the marjoram & dried mustard (less vinegar, flavors compete less with beefiness). I love this as leftovers. I just cooked this tonight. I used a left over standing rib roast which was original cooked on the rare side. I trimmed all the fat and used the outside pieces of fat with the onions to establish that so desired brown bits on the bottom of the pan. I didn't have any Cognac (but I will definately get some) - I used red wine, it made the sauce yummy still but turned it an awful purple. I also didn't have any dijon mustard - I substituted hot horseradish. I didn't have any noodles or rice but I had fresh Naan bread. I will stick to the recipe here next time and comment again. This was a very yummy meal. I once did this dish an its awesome. I belive i kinda failed in the cutting of the meat and it affected the final product tough. Lets say I have the cilindrical part of the T.m then, should I cut transversal sections of it and then cut each one of those into "bars" of meat?? Or how else?? That's the best way to do it - cut into transversal slices (ie. against the grain) and then into roughly equivalent sized bars about 1-in x 2-in. It doesn't take long to cook the slices, you want to do it only long enough to brown. Taste a piece as you cook each batch - if it's tough, you need to cook faster (higher heat). You should be looking for an extremely tender texture. Have prepared this four times and will be preparing again Monday Evening for the same guest that lived in Europe for 12 years. He says it is the best!!!!! just followed the recipe - well, I followed the ingredients (left out the dill) and the process, but was not precise with measurements. anyways, it turned out amazing! thank you!! Subject: This is the best! Beef Stroganoff has always been my favourite dish. However, I lost my tried and true recipe for it over 30 years ago - just after university. Since then, I've made lots and lots and loooots of just so-so beef stroganoff. I've made this recipe twice now. The first time was exactly as prescribed and the second was using stew beef. I can now say with confidence that this is even better than my lost recipe.